In 1984, India and Pakistan went to war over the Siachen Glacier. A 2003 ceasefire halted most of the fighting, but troops from both sides are still facing off and losing more soldiers every year to the climate, altitude and avalanches than to enemy fire. The extreme environment and the absurd origins of the conflict got my attention. Both countries are still contesting an uninhabited glacier — uninhabited, that is, except for soldiers. 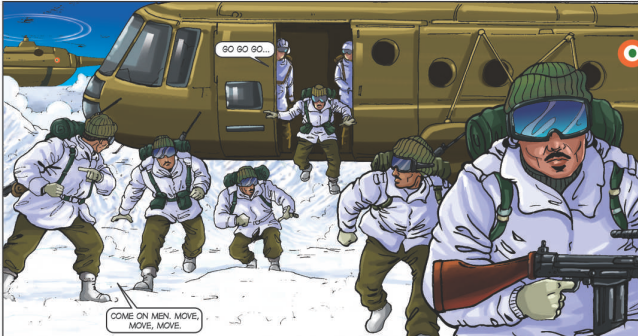 Then I discovered Siachen: The Cold War, a 2012 Indian comic book by Rishi Kumar, Mahender Kumar, Dhiranjan Dasgupta and retired Maj. Gen. Ian Cardozo. It’s part of a budding collection of English-language war comics from India that shed light on events that are largely unknown in the West. It’s a cool subgenre, and tracking down the book wasn’t easy. Eventually, I found a Mumbai-based vendor with a single copy that was willing to ship it to the other side of the planet. But would I recommend it? That depends. If you’re interested in Indian military history, mountaineering, or if you’re a journalist — ahem — who likes to write about obscure war comics, then I would. But the limited availability will likely deter most readers. Siachen: The Cold War is something of a hybrid. It’s a 48-page work of military history — derived from open sources — which closely follows the war’s actual events. It’s also pulpy and nationalistic, with heroic Indian soldiers and cackling Pakistani villains who wouldn’t be out of place in Sgt. Fury and his Howling Commandos. The jingoism didn’t sit well with me, but I won’t count it against it anymore than I would Sgt. Fury. The book knows what it is. The comic follows the origins of the war in the 1950s to a terrifying Pakistani ambush of an Indian patrol in May 1987. A sequel, Battlefield Siachen, carries the story forward from there … though I haven’t read that one. The Siachen conflict is, to put it mildly, a war that should have never happened. It’s an accident of geography, mountaineering and cartography. The conflict is about a line on a map neither side can agree on — with some ends-justify-the-means theories that say controlling the glacier would provide a tactical advantage if India and Pakistan ever fought a wider war. Never mind that soldiers are dying on the glacier today. More than 800 Indian soldiers have perished there, mostly due to the environment. A 2012 avalanche killed 129 Pakistani soldiers. It’s so high up, being there for too long can damage human organs, cost a person their limbs or their lives. The history is tragically absurd. In 1949, the First Kashmir War came to an end, and both India and Pakistan drew out a mutual border which ended at the glacier. Siachen was simply too high and treacherous — nearly 19,000 feet above sea level at its highest point — for either side to climb up. For years, Siachen remained a vast, unexplored and icy void along the Indo-Pakistani border. But that changed with the growth of mountaineering in the West as an extreme sport. An Italian expedition first reached the summit of nearby K2 — the world’s second deadliest mountain — in 1954. Three years later, British adventurer Eric Shipton reached the top of Siachen. Five years after that, a Japanese expedition climbed the glacier with a Pakistani military officer. More Pakistani-sponsored expeditions followed in a kind of oropolitics, or the use of mountaineering for political purposes. By the 1980s, India had mounted a military expedition of its own led by Col. Narinder “Bull” Kumar, in part provoked by the publication of U.S. military maps which included Siachen as part of Pakistani territory. Then in April 1984, India occupied the glacier with helicopter-borne troops. The Pakistani army was also preparing to occupy the glacier, but accidentally tipped off New Delhi by buying cold-weather gear from a London supplier which also supplied the Indians. After the Indian troops landed, Pakistani troops in mountain gear headed into the mountains, ready to fight. This background — a war provoked by mountaineering — and the logistical nightmare of keeping troops supplied on the glacier is the most interesting part of Siachen: The Cold War. Ground offensives depicted in the comic take months to organize, mainly because both sides have to spend the time acclimating their soldiers to the altitude. The Indians dominate the terrain, though, so early Pakistani attacks fail with heavy casualties. They shift to harassing the Indians with snipers and taking potshots at resupply helicopters. Eventually, the Indians try to evict the snipers in a disastrous nighttime counterattack. There’s plenty of blood, guts and courage. But mainly, I was bummed out. India controls the glacier today, with Pakistani soldiers dug in nearby. But there doesn’t seem much reason to it except national pride, and the fighting has long gone quiet. Both sides have a bigger foe with the elements than with each other. Some retired Indian officers have publicly called the whole war a mistake and a waste of lives and money. National self-determination has no relevance here. There are no civilians on Siachen, which means no one to claim that they’d prefer to live in Indian or Pakistani territory. The glacier is for all practical purposes uninhabitable. In fact, there wasn’t any fighting there at all before 1984, because only mountaineers could physically get up it. Then armies got involved, which added a circular, Catch-22 kind of logic. Technological advancements — such as helicopters — made occupying Siachen possible. Yet the only discernible rationale for continuing the occupation is to keep the other side from taking it. But so what? It’s just a glacier. The only reason there seems to have been a war at all is because there could have been one. The armies are there because they can be, and they fought because the other side could fight them for it. Siachen: The Cold War prefers to emphasize the heroics of the soldiers involved than to question the point of it all.